Castle staircases are spiralled the way shown in today’s photo, opposite to yesterdays, giving an advantage to a right handed person defending with a sword against an attacker coming up. 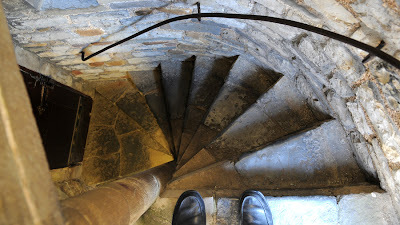 When I visited Cardiff Castle I asked the tour guide to explain this "error" in yesterday’s staircase. He said that we were in a newer part of the castle and this was a modern staircase not built for defence. Today’s photo, however, is in an old and original part of Cardiff Castle, built for defence with the right kind of staircase.